i've no doubt i could fill a great deal of black and yellow pixels with a discussion on the relative merits of hero-worship, a term that bears parallel with those pantone swatches. for not everyone means quite the same thing when using the same phrase, just as there's a darned sight more than just one shade of pink. personally, i'm none too sure that i actually have any heroes as such. there are those in several walks of life that i find inspirational, even if i have little desire or choice in emulating their footsteps, drum patterns or tyre tracks. pre-history (as in, any time before 1970), hero worship may have been a more prevalent ideal. though i have no wish to disparage the riders of today, it appears from anecdotal evidence that to make a career as a professional cyclist took a shade more guts and determination than is currently the case. i am not intending to compare the relative merits of today's cyclists with that of yesteryear, simply making the point that there are many more brits who earn a living from cycling today than you'd have counted in a continental peloton in the mid sixties. those were the years during which i had no idea that bicycles were other than a means to ride to my pals' houses, or very occasionally, ride to school. unlike this past sunday when itv's main channel presented stage one of the tour of britain live all afternoon, i cannot recall ever having watched cycle racing on the telly. mind you, in those far off days there were probably all manner of other distractions that would have kept a young boy away from the (black and white) television set anyway. tom simpson was one of those who cared little for fashion as far as one's mode of employ was concerned. a bright fellow who you could see as carving a career as a merchant banker nowadays, had little but coal-mining to look forward to in his youth youth. 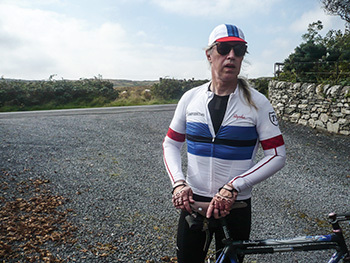 as it turns out, he became an apprentice draughtsman on leaving school and used the daily commute as training for the cycle racing he had already demonstrated himself to be rather good at. it would be a tad pointless and incongruous to detail every twist and turn of simpson's career both before and after making the move to continental europe, an all but unavoidable feature of becoming a professional cyclist. unlike recent years when, as a result of renewed interest in cycling as a sport, dramatic improvement in coaching methods, coupled with impressive funding opportunities, british domestic cycling can be regarded as a suitable apprenticeship for the top tiers of the sport, in the fifties and sixties and even into the eighties, the only way forward was to depart from british shores. this move, if nothing else, proves simpson's mettle in aiming for the top of his sport. he was invited to train in germany for the 1959 motor-paced world championships and elswick-hopper invited him to be part of a british-based team, both opportunities which he declined in order to make the move to france. "I don't want to be sitting here in twenty years' time, wondering what would have happened if I hadn't gone to France." 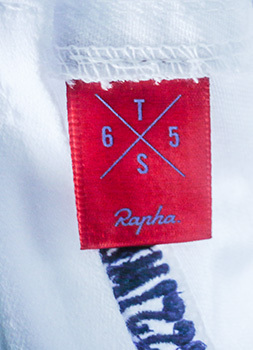 with the 2015 world championship road race but two weeks distant in richmond, virginia, rapha's simpson jersey celebrates the man's victory in the 1965 road-race championships held in san sebastian, spain, making him the first british cyclist to do so. i'm sure that, aside from his enduring popularity as a rider, the fact that he rode at one time for the rapha-gitane-dunlop cycle team makes him one of imperial works' favoured sons. that and the fact that he won stages of the vuelta, wore le tour's yellow jersey, achieved outright victory in paris-nice, flanders, bordeaux-paris, milan-san remo and the tour of lombardy no doubt helped his case greatly. 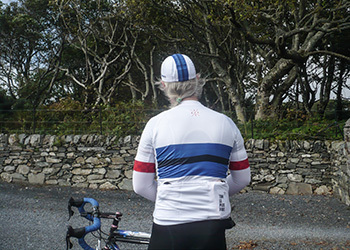 tribute jerseys can be something of a hit or miss; the concept is mostly laudable, always assuming the majority of cyclists hold the fêted rider in similar high esteem. though simpson ultimately met his fate on the slopes of mont ventoux in 1967, his palmares would undoubtedly have garnered every bit the same adulation as is currently the case had he survived the heat of provence. 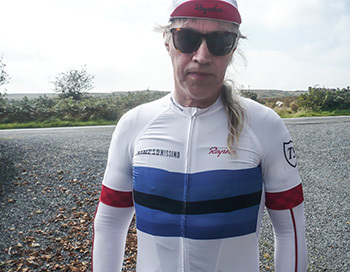 many modern-day cyclists may well only know him as 'that bloke who died on ventoux'; if rapha's release of this jersey does anything to bring his racing career to the attention of the great unwashed, then it will be a praiseworthy event in itself. 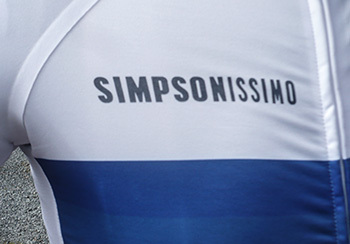 a portion of the profits from the sale of the tom simpson jersey will go to the simpson family to be used for maintenance of the memorial on mont ventoux. the jersey itself is effectively a member of rapha's pro-team collection featuring a lightweight, high wicking technical fabric that's the culmination of all those kilometres logged with teams sky and wiggins. in fact the wiggins team wore a slightly altered version of this jersey in the opening stage of the tour of britain. it is, as they say, a race cut, meaning that wearing it around the house, pre-ride might feel a tad awkward. sat in the saddle with hands on the brake hoods, it not only feels right, it does have a certain propensity to add gravitas to one's demeanour. taken from newspaper headlines of the day in 65, the right breast bears the word simpsonissimo, while the right rear pocket states tom le plus fort. these thoughtful details, including a full-length zip, do not however, stop there, as there is a commemorative 1965 logo below the minimal collar on the back and the words 'a glorious mix of courage and cunning featured on the inside of the collar itself. 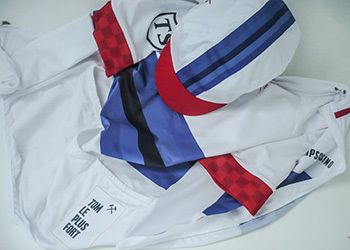 the right sleeve has simpson's intials inside a shield similar to that usually encapsulating th letters bp, while the red chequer board pattern on the sleeve cuffs alludes to simpson's years with the peugeot team. overall, the white red and blue colours are reminiscent of those featured on the gb jersey in 1965.
the jersey side panels are constructed from a stretchy lightweight mesh fabric to aid breathability as is the brief section below the rear pockets. and speaking of the pockets, their ability to swallow far too much stuff (do i really need all that on the sunday ride?) was little short of impressive. matching the colours and style is a water-resistant cotton cap that really ought not to be an option; i figure rapha ought to have made this one of their capsule collections, for as a limited edition tribute to one of britain's finest ever cyclists, why on earth would you buy one without the other? 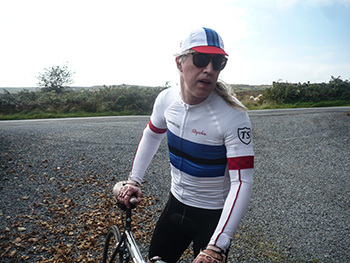 if you already own a rapha pro team jersey, you will surely need no further testimony from me. 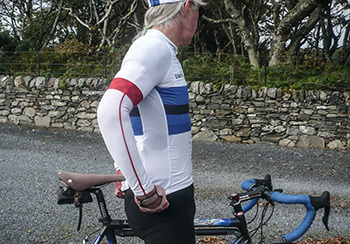 if your cycle wardrobe is bereft of pro team, there is likely no better means of introduction. 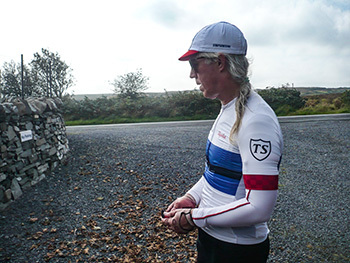 the rapha tom simpson commemorative jersey is available in sizes ranging from xs to xxl at a cost of £130. the cap is one-size-fits-all at a cost of £25. at the time of writing, the jersey is out of stock, but i have asked when more stock is due.